Cynosurus coracanus L., Eleusine africana Kenn.-O'Byrne, Eleusine indica subsp. africana (Kenn.-O'Byrne) S. M. Phillips, Eleusine tocussa Fresen. Finger millet has both a cultivated form (Eleusine coracana subsp. coracana) and a wild form (Eleusine coracana subsp. africana) which is an aggressive colonizer (Dida et al., 2006). 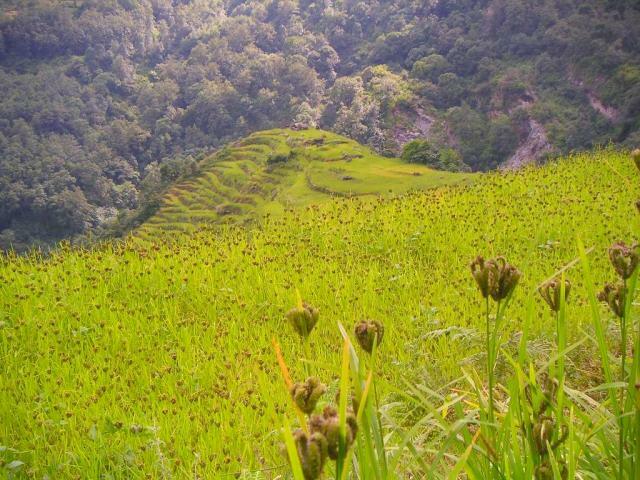 Finger millet (Eleusine coracana (L.) Gaertn.) is a cereal grass grown mostly for its grain, which is a staple food in many African and South Asian countries (for information concerning the feed uses of the grain, see the Finger millet, grain datasheet). Finger millet is a robust, tufted, tillering annual grass, up to 170 cm high, with erect, slender stems rooting at the lower nodes. The shallow root system is fibrous and strong, difficult to pull out (FAO, 2012; de Wet, 2006; Quattrocchi, 2006). Stems and leaves (up to 75 cm long and 2 cm broad) are usually green. The inflorescence is a panicle with 4-19 finger-like spikes that resembles a fist when mature, hence the name finger millet (de Wet, 2006; Quattrocchi, 2006). The spikes bear up to 70 alternate spikelets, carrying 4 to 7 small seeds (Dida et al., 2006). Finger millet is cultivated as a fodder grass in many places including India, the USA and Ireland. It provides excellent hay and is used as green forage for cattle, sheep and goats (de Wet, 2006; Mgonja et al., 2007; Baker, 2003). The straw resulting from the grain harvest is valuable and can be grazed directly by the animals or used in cut-and-carry feeding systems. In Africa, finger millet straw is also used for making strings and for thatching (de Wet, 2006). 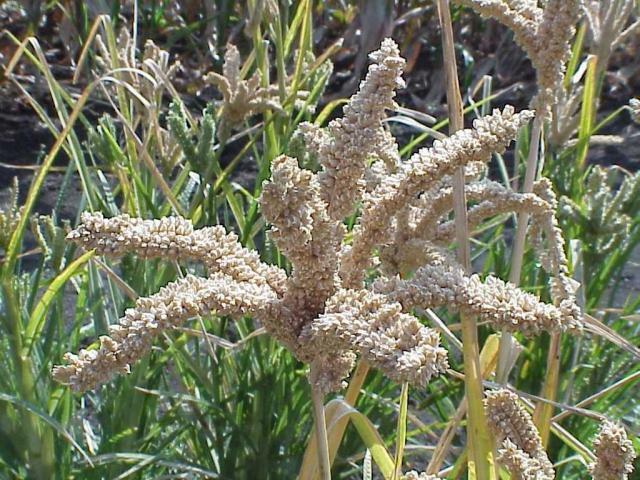 Finger millet is thought to have been domesticated at the beginning of the Iron Age in Africa and was introduced into India 3000 years ago before spreading to South-East Asia. It is widespread in warm temperate regions from Africa to Japan and Australia but can also grow in colder regions, as far north as Northern Ireland, during summer. Finger millet is a fast growing cereal crop that reaches maturity within three to six months and sometimes in only 45 days (Dida et al., 2006). It is generally found in disturbed areas, roadsides and banks (Quattrocchi, 2006). It is commonly found between an altitude of 1000 and 2000 m in Eastern and Southern Africa and up to 2500-3000 m in the Himalayas (FAO, 2012; Dida et al., 2006). It grows best at an average temperature of about 23°C, but can withstand both cooler and hotter conditions (FAO, 2012). Annual rainfall ranging from 500 to 1000 mm is suitable, provided it is well distributed during the growing season (Dida et al., 2006). Finger millet will keep growing in drier conditions but pearl millet and sorghum will be preferred below 750 mm (de Wet, 2006). Finger millet is intolerant of flooded conditions but withstands some waterlogging. It does not do well in areas of heavy rains, but prefers damp conditions (Baker, 2003). Finger millet is adapted to a wide range of soil conditions though it prefers fertile, well-drained sandy to sandy loam soils, with a pH ranging from 5 to 7. However, it will grow on lateritic or black heavy vertisols and has some tolerance to alkaline and moderately saline soils (Dida et al., 2006). Finger millet seeds can be broadcast or sown in rows after prior ploughing and weeding, as the crop is particularly weed-sensitive. In India, it is also commonly planted after germination in nurseries (de Wet, 2006). Finger millet can be sown alone or intercropped with companion cereals, pulses or vegetables. It can also be sown as the first crop in a rotation, thus requiring weeding (de Wet, 2006). Fodder yields vary greatly according to cultivation conditions. In India, under rainfed conditions, finger millet straw yield was about 2-3 t/ha and reached 6-10 t/ha while under irrigation (Sampath, 1986). Finger millet intended for forage should be cut at vegetative stage (around 80 days after planting) for making good quality hay or silage (Madibela et al., 2004). When cut 2 or 3 times during the growing season, it yielded 33 t green matter/ha (Sampath, 1986). Finger millet tillers heavily and roots from the lower nodes, thus providing excellent protection against soil erosion (de Wet, 2006). Finger millet can be used in zero-tillage crop/livestock systems as a second rainfed crop for green chop forage, silage, grazing or as a cover crop (Landers, 2007). 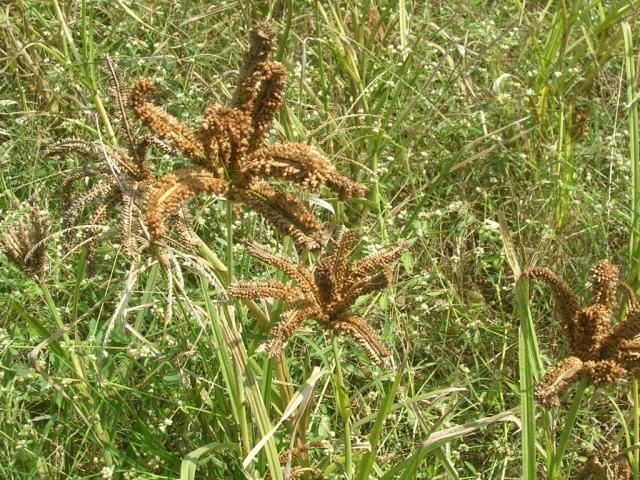 The wild form of finger millet is an aggressive colonizer that forms large continuous populations in disturbed habitats. It can invade fields of cultivated finger millet and occasionally crosses with the cereal crop, producing weedy hybrids (de Wet, 2006). Finger millet forage has a low nutritive value. The fresh forage contains about 5-8% DM of protein (11% DM for the leaves) (Bakhashwain et al., 2010). Like other cereal straws, finger millet straw is highly fibrous (NDF more than 70% DM) and even poorer in protein than the fresh forage (about 5% DM). Its nutritive value can be improved by ammonia and urea treatment (Prasad et al., 1993; Deshmukh et al., 1995; Ramachandra, 1997). Its nutritive value also increases with stacking: fermentation makes it more palatable and less tough. Straw from irrigated finger millet is tough, contains more fibre and is less palatable than rainfed finger millet straw (Sampath, 1986; Göhl, 1982). In Uganda, there was a belief that abortions occurred in cows grazing finger millet stalks but no evidence of such problems has arisen (Khizzah, 1986). While finger millet is grown for fodder, most of the information available is about the straw, which is an important by-product of the grain crop. Since finger millet straw is of poor nutritive value, it must be supplemented with nitrogen and energy sources in order to meet maintenance or production requirements. As with other cereal straws, its nutritive value can be improved by urea and ammonia treatment, but supplementation must be adapted accordingly. Some examples of milk production and weight gain obtained with crossbred dairy cows fed with finger millet straw as the roughage with variable amount of concentrate are presented in the table below. Finger millet straw can be used as forage in diets for crossbred dairy cows supplemented with a balanced concentrate mixture (energy and protein). Such diets allow 8 to 9 kg milk yield (Chandrasekharaiah et al., 2004; Bhatta et al., 2000) and a body weight gain of 200-300 g/d (Bhatta et al., 2000). Finger millet straw supplemented with 5 to 20 kg of green maize (Deshmukh et al., 1995) or 3.9 kg DM of Para grass (Brachiaria mutica), plus 3.9 kg DM concentrate (Gowda et al., 2005), produced a daily milk yield of 3.1-3.2 kg/d in 250 kg dairy cows (Deshmukh et al., 1995). Heavier animals, of 350 kg, on a similar diet had a milk yield of 7.7 kg/d (Gowda et al., 2005). Urea-treated finger millet straw supplemented with 5 kg green maize supported a daily milk yield of 3.5 kg/d in 250 kg local breed dairy cows (Deshmukh et al., 1995). Finger millet straw can be offered as sole feed to crossbred heifers (average 230 kg) to meet maintenance requirements if offered in sufficient quantities to allow for a refusal rate above 30%, thus giving a maximum DM intake of 70 g/kg W0.75 (Rao et al., 1994). Finger millet straw is a valuable forage for growing heifers when supplemented with wheat bran (25%) and groundnut cake (Prasad et al., 1997). Finger millet straw can be used as forage for growing heifers (155 kg) supplemented with a small amount of concentrate (0.89 kg DM). Dry matter intake of the straw was about 3.5 kg/d and the daily weight gain was 310-350 g/d (Darshan et al., 2007). Finger millet straw can be used as forage in diets of replacement heifers fed with a well-balanced supplement (nitrogen and energy) without any reproductive problems (Gupta et al., 2008). Finger millet straw used as the base forage in sheep diets supplemented with concentrate (33%) maintained body weight (23-26 kg) for 150 days (Gowda et al., 2008). Dry matter intake of finger millet straw offered as sole forage without supplement was low (0.411 kg/d or 49.3 g/kg W0.75), as was DM digestibility (54.5%) (Chandrasekharaiah et al., 2010). Dida, M. M. ; Devos, K. M., 2006. Finger millet. In: Chittarajan, K., Genome Mapping and Molecular Breeding in Plants, Springer-Verlag, 1: 333-344. Husson, O.; Charpentier H.; Michellon, R.; Razafintsalama, H.; Moussa, N.; Enjalric, F.; Naudin, K.; Rakotondramanana; Seguy, L., 2012. Eleusine coracana. Fiches techniques plantes de couverture : Graminées annuelles, Manuel pratique du semis direct à Madagascar. Volume III. Chapitre 3. § 2.2. Mgonja, M. A. ; Lenné, J. M. ; Manyasa, E. ; Sreenivasaprasad, S., 2007. Finger Millet Blast Management in East Africa. Creating opportunities for improving production and utilization of finger millet. Proceedings of the First International Finger Millet Stakeholder Workshop, Projects R8030 & R8445 UK Department for International Development – Crop Protection Programme held 13-14 September 2005 at Nairobi. Styslinger, M., 2011. Finger millet: A once and future staple. Worldwatch Institute. Nourishing the Planet.